Improved financial guidance for Q3 has finally ignited this beaten-down airline stock. 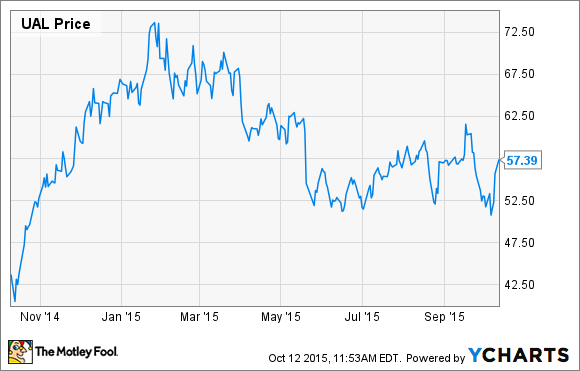 Like many other airlines, United Continental (NASDAQ:UAL) has seen its stock slide in 2015 even as profit has surged. Through the first half of the year, United Continental posted an adjusted profit of $1.84 billion, up from only $430 million in the first half of 2014. Yet just a week ago, the stock was sitting more than 30% below the all-time high set back in January. However, United Continental raised its Q3 profit guidance on Thursday afternoon. This update appears to be giving investors more comfort that the company's financial improvements are sustainable. The stock gained a combined 10.6% on Friday and Monday. In July, United's management projected that the company would generate a 13.5% to 15.5% pre-tax margin during Q3, despite a 5%-7% year-over-year decline in passenger unit revenue. For comparison, United's adjusted pre-tax margin was just 10.2% in Q3 2014. On Thursday, United Continental raised its pre-tax margin guidance for the quarter to 16%-17%. Some portion of the increase appears to be driven by an accounting adjustment related to United's new co-branded credit card agreement, which isn't very meaningful to the company's long-term profit potential. However, United also estimated that its unit revenue decline was no worse than the midpoint of its original guidance range, fuel prices were slightly lower than expected, and adjusted non-fuel unit costs declined 1% to 1.5%. Furthermore, its new credit card deal has improved terms that could potentially add hundreds of millions of dollars to United's bottom line annually. United's profit is rising even more than originally expected. Photo: The Motley Fool. Analysts have taken notice of this bullish investor update, raising their estimates for United's third quarter and full-year 2015 earnings. Like its peer Delta Air Lines, United has been paying significantly more than the market price for jet fuel this year due to hedging losses. As of late July, United Continental estimated its full-year average fuel price (including hedging losses) at $2.07-$2.12 per gallon. Oil prices have dropped since then, so the full-year average will probably be closer to $2.00. Still, that's a solid $0.25 per gallon above what American Airlines -- which does not hedge -- will have paid, equal to roughly $1 billion over the course of the year. By contrast, United Continental has a much smaller hedge position for 2016, purchased at much lower prices. That means it could realize additional fuel cost savings next year even if oil prices are somewhat higher than in 2015. The company will also continue benefiting from its new credit card deal and its ongoing cost reduction efforts. Thus, United is well positioned to grow its pre-tax earnings again next year. Even after rising 10.6% in the past two trading days, United trades for just 5 times its projected 2015 pre-tax earnings. (That's equivalent to roughly 8 times after-tax earnings.) The company has a variety of levers for future earnings growth, too, making the stock look surprisingly cheap. The upshot is that as long as United Continental continues to show that it's getting past its long-running merger integration problems and making sensible moves to improve its profitability, the stock may keep rallying. United shareholders should be patient and hold on to the stock rather than selling for a quick profit.